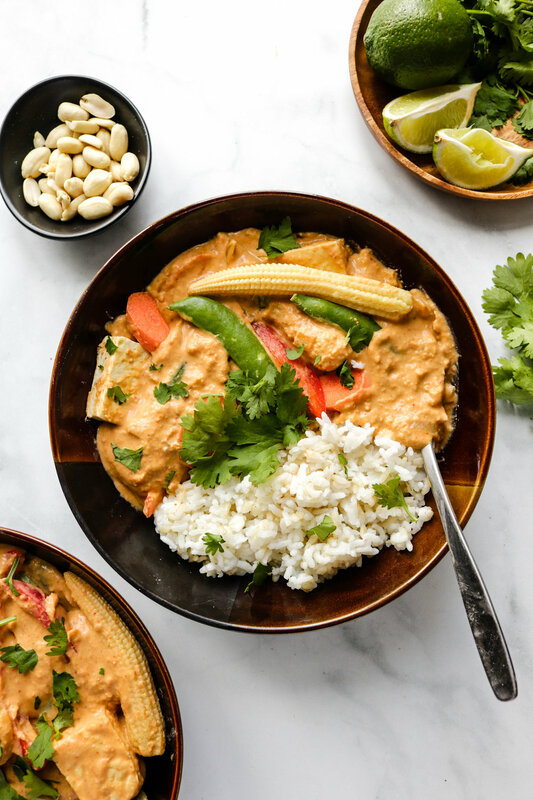 This Vegan Red Thai Coconut Curry is loaded with vegetables and tofu, all covered with a creamy, thick and aromatic red coconut curry sauce. It’s an easy, vegan, gluten free, oil free & high protein dish made in just 30 minutes! We are officially in spring! While the weather is getting nicer here in Toronto, evening time is still super chilly, so thats my justification for still craving and making soups, stews and curries 😅. This recipe was made for my boyfriends 1 week plant based diet challenge and it was SO dang delicious. This isn’t your typical red thai curry thats soupy and runny (which I also love too). This version is so thick and creamy it coats every piece of vegetable and tofu. The aromatic flavours come from the ginger, garlic, onions and red curry paste. To make it creamy we used coconut milk, the full fat kind- trust me.. it makes a difference. We were also looking for ways to add in some extra protein into his diet, so we pureed chickpeas and mixed that into the sauce. This definitely helped with the thick and creamy texture (plus added in a lot more protein). Curries are my favourite meals to make when it chilly out, it’s so versatile and it keeps well in the fridge or freezer! You can mix and match vegetables based on what you like and already have in the fridge. I love tofu in my curries, so thats the protein we chose but mocks meats, other beans and legumes would be just as delicious here. I’ll definitely be enjoying curries while the chilly weather lasts 🙈. 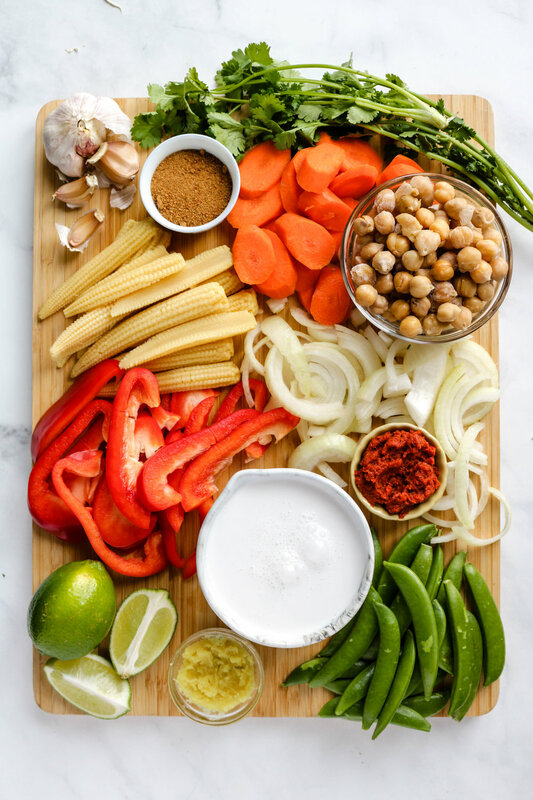 The key ingredient to making a delicious thai curry is to use lots of aromatics and a perfectly spiced curry paste. My favourite of all time is this one by Maesri. When other store bought curry pastes, be sure to check that it is vegan! You can substitute full fat coconut milk for light coconut milk, it will still be delicious but not as rich and creamy. Any vegetables can be used here. I like cooking the vegetables separately so it doesn’t over cook because each vegetable has different cooking times, but you can cook them all in the sauce while it simmers. If you recreate this Vegan Red Thai Coconut Curry please share it and let me know what you think by tagging me on Instagram @lisakitahara, I love seeing all of your tasty recreations! 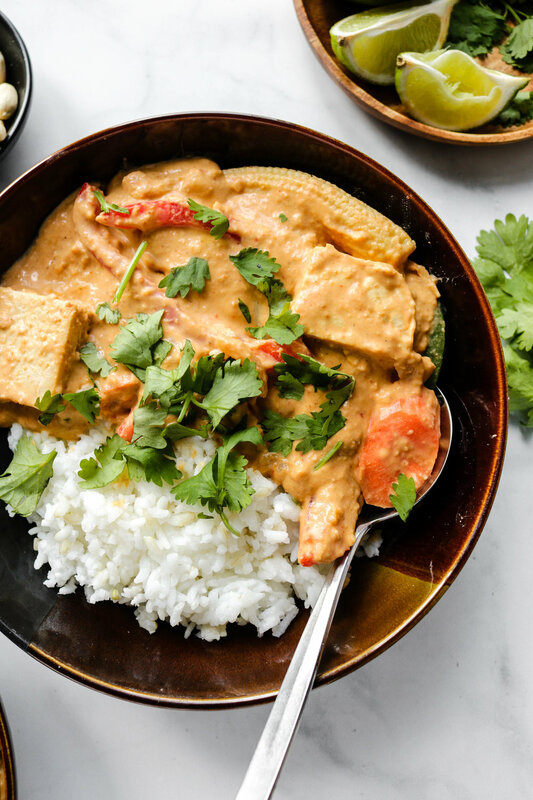 This Vegan Red Thai Coconut Curry is loaded with vegetables and tofu, all covered with a creamy, thick and aromatic red coconut curry sauce. It’s an easy, vegan, gluten free, oil free dish made in just 20 minutes! Fry the onions over medium high heat until slightly tender (5 minutes). Then add in the garlic, ginger and red curry paste and fry for another minute or until fragrant. Add in the coconut milk, pureed chickpeas, and broth. Cover the pot and allow it to simmer for 15 minutes, mixing occasionally. In the meantime, pan fry your tofu over medium heat until desired crispiness on the outside. Cook your vegetables lightly by steaming or nuking. Taste the sauce and adjust by adding in soy sauce, salt and more coconut sugar. Take the sauce off the heat. Add in the tofu and vegetables and mix until everything is coated with the curry sauce and combined. Serve immedietly over fresh rice and garnish with green onions and cilantro. *This yield a thick sauce, similar to what is shown in the photo. If you prefer a runnier viscous sauce, add 1 more cup of broth and adjust the spices to taste!